Manila, Philippines (CNN) -- With memories of last year's killer typhoons still fresh, Typhoon Megi roared across the Philippines on Monday, ripping through roofs and cutting off electricity. The cyclone's peak wind speeds decreased as the system moved over the Sierra Madre mountains, but it still packed sustained winds of around 167 kph (103 mph) with gusts up to 204 kph (126 mph), according to the Joint Typhoon Warning Center. This is down from peak sustained winds of 212 kph, with gusts up to 259 kph (161 mph), over the weekend. 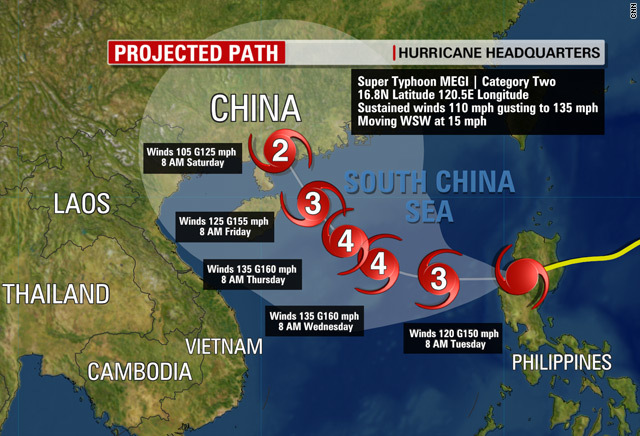 Megi, also known as Typhoon Juan, was expected to pick up steam again as it heads over the South China Sea. Current forecasts from the Joint Typhoon Center show the storm heading toward the southeastern China coast, just west of Hong Kong. In the Philippines, five people have died in what the National Disaster Risk Reduction and Management Council is billing as the strongest storm of the year, according to Catherine Martin, manager of disaster management services at the Philippine National Red Cross. Emergency workers pulled the body of Vicente Decena, 53, from a bloated river; a tree fell on the house of Aileen Respicio, 20, killing her and injuring her child. Five others were injured elsewhere, the disaster council reported. Unfortunately, this is a part of the world where the infrastructure is quite fragile. Even as it weakened, Megi continued to pose a serious threat. Trees swayed and relentless rains inundated roads. Storm chaser James Cabrera, who was in Luzon, said parts of the Philippines could see 300 to 500 millimeters (12 to 20 inches) of rain. "Unfortunately, this is a part of the world where the infrastructure is quite fragile, the power grid is quite fragile and a lot of people live in quite basic houses," James Reynolds, a storm chaser who is on Luzon, told CNN on Monday. "We have learned our lessons from the grim experiences we had during typhoons Ondoy [known internationally as Ketsana] and Pepeng [Parma]," House Speaker Feliciano Belmonte Jr. said, according to the Philippine News Agency. "We must all cooperate because nature's wrath exempts no one." A year ago, tens of thousands of people were in evacuation centers as four consecutive typhoons drenched the Philippines. About 500 people were reported dead. Journalist Eduardo Lingao in Manila contributed to this report for CNN.